Do you want to know the right things to say in informal and formal meetings? Do you want to speak confidently with business coworkers and clients? Do you want to understand how American meetings work? This course teaches you both formal and informal business English you need to participate in business meetings. You learn how American business meetings are structured and how to participate in each part – from starting a meeting, to introducing speakers, making a presentation, managing a discussion, answering questions, and ending meetings. Meeting A is an informal business meeting. Meeting B is a formal business meeting. No matter what kind of meeting you attend or what type of business you work in, this course covers important business vocabulary useful for anyone needing to communicate better in an English-speaking professional setting. This course takes you step-by-step through both formal and informal meetings. Meeting A: Learn how to start a meeting when you know most of the people at the meeting and can be a little more informal. 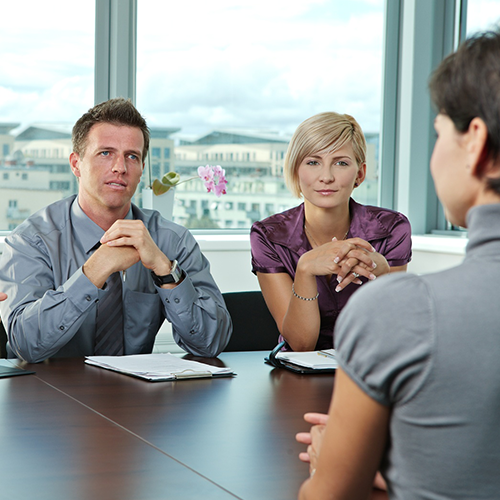 Included are expressions related to asking for opinions and planning the meeting. Meeting B: Meeting with clients or people from outside your company? Find out how to talk about your company and its goals in a more formal business meeting setting. Meeting A: Learn how to introduce yourself at an informal meeting, as well as some common titles that people have in American businesses. Meeting B: If you have to introduce other people at a meeting in English, this part of the lesson will teach you the proper forms and procedures. Meeting A: Learn how to properly introduce a presentation by giving your audience an overview of what will take place. Meeting B: This part of the lesson also shows how to begin a presentation, this time using a more formal tone and vocabulary. Meeting A: The key parts of an effective presentation are organization, detail, and honesty. You’ll find all of these in this example of an informal presentation. Meeting B: A more formal presentation requires a more formal tone and vocabulary, both of which are demonstrated in this part of the lesson. Meeting A: Images are powerful tools, and this is also true in business presentations, as you will see in this lesson. Meeting B: This part of the lesson takes a closer look at the different ways that information can be presented. Meeting A: Learn key vocabulary for a ending a business presentation, along with some useful ideas on how to motivate your team. Meeting B: Using a different vocabulary and tone, this segment of the lesson deals with many of the same issues as the previous segment, but in a more formal way. Meeting A: Group discussions can sometimes be difficult, but everything will go better if you know the polite way to make your point, and this lesson gives some excellent examples. Meeting B: In this segment of the lesson, we see how a more formal group discussion handles disagreement between people. Meeting A: Every meeting has to end sometime, but people often want to keep talking. Learn how to bring a presentation to a polite end. Meeting B: This segment of the lesson shows how presentations are commonly ended, as well as how to remain respectful in an uncomfortable situation. Meeting A: Most successful business meetings end with plans for what to do next. In this lesson, you will learn the vocabulary for making plans. Meeting B: In this segment, you will see how a more formal meeting might end discussion of a topic, with additional vocabulary used to describe this process. Meeting A: Time to get back to work! Learn how to bring an informal meeting to a successful close. Meeting B: This part of the lesson shows how a formal meeting is brought to an end, using additional vocabulary often used in business.